I hate it when milk sours before we drink it all. Such a waste! Now, if you have visited this blog at all, you know how I love to prolong the life of items, turning them into a little fun before their final days are over. And so it is with the milk. This reminded me of an activity I used to do with my children. The activity is sometimes called Swirling or Marbled Milk. I like to call it rainbow milk. 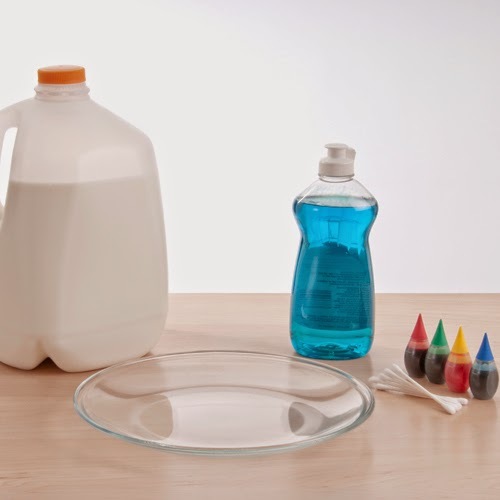 It is a wonderful demonstration of emulsifiers in action and it is really NEAT! Whether you have sour or fresh milk this is an activity you can do with your kids that will produce tons of fun! The nice thing about this activity is that it is quick and easy to do. It is a perfect activity to do before or after a meal. If someone leaves some milk behind after eating, no problem! Whip up this activity. Do you need entertainment that will mesermize your children while you fix a meal? This is a perfect solution! Give this activity a try! It will sure to be a favorite! pie tin, plate with high sides, plastic storage container etc. 3. liquid dish detergent (NOT dishwasher detergent) Dawn or Palmolive are my favorites. 1. Pour a little milk in the bottom of your container. 4. Watch the colors swirl! As swirling action dies down, add another drop to the milk. What happens? How long does the swirling action occur? What colors are produced when the colors mix? If you move the dish, what happens to the swirling action? 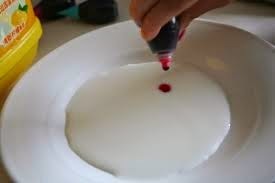 After observation of the swirling action for awhile, children may want to see what happens if they disturb the color flow by touching a Q-tip to the surface of the milk. What reaction happens? 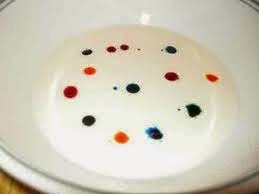 Try this experiment with only two colors, then with only three colors. When you mix red and yellow what color is created? If you mix red and blue together, what color is formed? How about yellow and blue?